Leading from my own recommendations, this is the second episode of “Vampire Library”—a series of “guest posts from other writers involved in the vampire field, discussing books they’d recommend” to further studies of the genre. I’m proud to present the following instalment by someone who’s been very influential on my own writings: Niels K. Petersen, author of the brilliant, always-informative blog, Magia Posthuma. I have a confession to make: I am often bored by books on vampires. They either reiterate what has already been written numerous times, or they simply collect tales of “the undead” without attempting to establish connections or underlying structures. For that reason, when asked to write about my favourite vampire books, I am tempted to recommend some books that, on surface, have little to do with vampires per se, but from my point of view are still of relevance. So first off, I have decided to mention a book that only briefly mentions vampires, and actually just Count Dracula, but to me it is still relevant for many other reasons: Claudio Magris’s Danube: A Sentimental Journey from the Source to the Black Sea (1986), a book that defies categorization: It is neither a novel nor a non-fictional work, but perhaps rather a book-length essay that follows, one assumes, the author’s journey from the sources of the Danube in Germany en route through Austria, Slovakia, Hungary, Serbia, and along the border of Romania and Bulgaria on to the Black Sea. Still, it is not a travel book, but rather a collection of the author’s thoughts on Central European history, architecture, literature, and cultural history in general, inspired by what he encounters while following the Danube. It is in this context that Dracula turns up, as do a few other persons that have some bearing on the theme of vampires, fictional and non-fictional. Context here is important. Many books are mainly focused on “collecting” vampires, while an attempt at understanding or at least placing the tales in a historical or social context appears to be of little concern. Other books do, however, seek to establish the intellectual context within which revenant beliefs have existed, but are often voluminous or academic in style and intent. One that is both informative and easy to read is the highly enjoyable Strange Histories: The Trial of the Pig, the Walking Dead and Other Matters of Fact from the Medieval and Renaissance Worlds (2007) by Darren Oldridge, an introduction to “strange” historical phenomena like revenants, werewolves, and witches, and their “rationality”. Not a bad place to start a study of the world of revenants and vampires, in my opinion. Continuing to books more closely associated with vampires, one of the most remarkable books has to be Dieter Sturm and Klaus Völker’s anthology Von denen Vampiren oder Menschensaugern. Originally published by Carl Hanser Verlag in Munich in 1968 as part of a voluminous Bibliotheca Dracula, it collects both fictional and non-fictional material on vampires over no less than 607 pages. Sturm and Völker were both into drama and theatre, so the fictional vampire was probably their main interest, but Völker, who had studied literature, art and philosophy, wrote a historical essay on vampires. 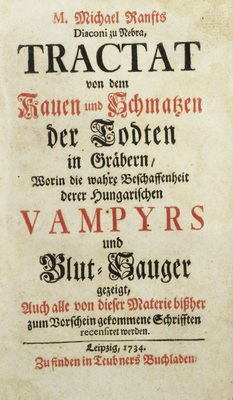 A milestone in the publishing of source material on vampires, the book includes writings by Martin Böhm, Philip Rohr, Michael Ranft, Augustin Calmet and Voltaire. Of particular importance, Sturm and Völker included one version of the Visum et Repertum on the matter of vampires in Medvegia (Medvedja) in Serbia in 1732, an inclusion that I found particularly enlightening when finding the book in my youth. That the editors of the anthology had a background in drama and fiction is characteristic of many authors on the subject from the early twentieth century and onwards. This is the case of another personal inspiration, Stefan Hock’s Die Vampyrsagen und ihre Verwertung in der deutschen Literatur published in 1900, which is primarily a study of the vampire in German literature, but it does contain some parts on the theme’s background in folklore and in eighteenth century literature. Going backwards in time, it can be not only very interesting, but in fact quite enjoyable to read some of the books and magazines from the seventeenth and eighteenth century that have a bearing on vampires and revenants. I would like to mention four that I have returned to a few times over the years. First of all, Michael Ranft’s Tractat von dem Kauen und Schmatzen der Todten in Gräbern published in 1734 just after the deluge of writings following the publishing of the Visum et Repertum in early 1732. It is actually the third edition of his work, which he began as a student in Leipzig in 1725, when he read about the vampire incident in Kisilova (Kisiljevo) in Serbia. Taking up the subject of the masticating dead, which had been the subject of a study by Philip Rohr published in Leipzig in 1679, Ranft proposed a theory concerning the vegetative continuation of some basic life in corpses. His theory was commented on or ridiculed by others in 1732, but Ranft waited until 1734 before himself retaliating by translating his Latin work into German and including an extensive commentary on all the writings about vampires he knew about. Ranft’s criticism of other writers and their opinions makes for some amusing reading, while it also serves as the first history or commentary on the debate on vampires and revenants of that era. More influential was Augustin Calmet’s book on vampires, Dissertations sur les anges, des demons & des esprit et sur les revenans et vampires de Hongrie, de Boheme, de Moravie & de Silesie (1746), which also grew out of reading about vampires when they were all the rage in the 1730s. Calmet not only compiled whatever information he could find in print, but also corresponded with people who could provide more information. Being himself at the forefront of a more rational and historical view of religion, but at the same time a defender of Catholic tenets, Calmet walked the borderline between rationality and faith, and was consequently criticized by both other Catholics and the propagators of Enlightenment. While Calmet’s book became a bestseller that was translated into German, English, Italian, and Russian, two other noteworthy texts found only a limited number of readers at the time. One being the investigations of vampire incidents by an Austrian military surgeon, Georg Tallar, published in 1784 as Visum repertum anatomico-chirurgicum oder Gründlicher Bericht von den so genannten Blutsäugern, Vampier oder in der wallachischen Sprache Moroi, in der Walachey, Siebenbürgen, und Banat, and the other Gerhard van Swieten’s commentaries on vampires and posthumous magic, originally a report written in French for the Austrian court of Empress Maria Theresa in 1755, and later translated into German as an appendix to Abhandlung des Daseyns der Gespenster (1768). Both texts reflect the growing rationalistic reaction to accounts of vampires, and are worth a read. Summers’s books were reprinted in USA around 1960, providing reading material for a new generation that was also growing up on TV reruns of Universal horror films like Tod Browning’s Dracula (1931) and the recreations in graphic colour of the classics of “Gothic horror” by British Hammers Films. At the same time, new studies of the vampire were published in both France and Italy. Tony Faivre detailed much information on vampires from a relatively historical point of view in his Les Vampires: Essai historique, critique et littéraire published in 1962, while Emilio de’ Rossignoli also incorporated information on fictional vampires in Io credo nei vampiri published in 1961. Both books were pioneering efforts at the time, but have been hard to get hold of (Rossignoli’s book was, however, reprinted in 2009). In English, several books on Dracula and vampires appeared during the Sixties and the Seventies, most of them inspired by Montague Summers on the one hand, and on the other the notion of Vlad Tepes as “the historical Dracula”. Although I have some nostalgic feelings towards several of them, I will only include one here as a favourite: Christopher Frayling’s The Vampyre: Lord Ruthven to Count Dracula (1978), another anthology containing some bits and pieces of a more historical interest. Frayling obviously had gone back to many of the sources that were at the time relatively easy to find, including a modern reprint of van Swieten’s Remarques, as he thought the original had disappeared. He clearly criticized Summers, calling the work of Faivre and Sturm and Völker “both much more scholarly, and can be trusted more than the (many) Summers derivatives.” (13 years later, Frayling resurrected his book, now titled Vampyres: Lord Byron to Count Dracula, incorporating more material on Dracula in particular). Largely unnoticed at the time, Aribert Schröder in the early Seventies extensively searched various libraries and archives for his thesis on the development of vampirism from a theme to a motive of English literature in the early nineteenth century, Vampirismus: Seine Entwickling vom Thema zum Motiv (1973). Accordingly, Schröder made many important observations and discoveries in his minute search for the exact development from the archival sources to Polidori’s The Vampyre. A great read for those interested in these minutiae, the book suffers from the shortcoming that the source documents are not reprinted along with the thesis. That, however, was remedied a couple of decades later, when Klaus Hamberger wrote his thesis on vampirism. Accompanying his thesis he published two volumes, one of which is the most thorough anthology of source texts on vampires and the vampire debate from the century between 1689 and 1791, from Valvasor to Voltaire and other protagonists of the Enlightenment. Mortuus non mordet: Kommentierte Dokumentation zum Vampirismus 1689-1791 (1992) is not perfect, but perhaps the single most important book on the subject so far. His companion volume, Über Vampirismus: Krankengeschichten und Deutungsmuster 1801-1899 (1992), on the other hand is mainly inspired by the vampire fiction of the nineteenth century, and actually rather difficult to read. More documentation, visual as well as textual, can be found in the exhibition catalogue Dracula. Woiwode und Vampir (2008) by Margot Rauch, Alfred Auer, Veronika Sandbichler, and Katharina Seidl. Primarily focusing on Vlad Tepes and the fictional vampire, the catalogue still includes a number of photos of important archival material and books, including the original manuscripts concerning the examination of purported vampires in Medvedja in the winter of 1731-2. The catalogue is also available in Romanian, and I would say it is essential reading. As for more recent studies of the vampire in general, I would mainly recommend a handful of books in German, all of which contain interesting information and observations. In chronological order: Peter Mario Kreuter’s Der Vampirglaube in Südosteuropa (2001), Peter Kremer’s Draculas Vettern: Deutschlands vergessene Vampire (2006), Hagen Schaub’s Blutspuren: Die Geschichte der Vampire (2008), Florian Kührer’s Vampire: Monster, Mythos, Medienstar (2010), Nicolas Equiamicus’s Vampire – Von damals bis(s) heute (2010), and Anja Lauper’s Die ‘phantastische Seuche’: Episoden des Vampirismus im 18. Jahrhundert (2011). 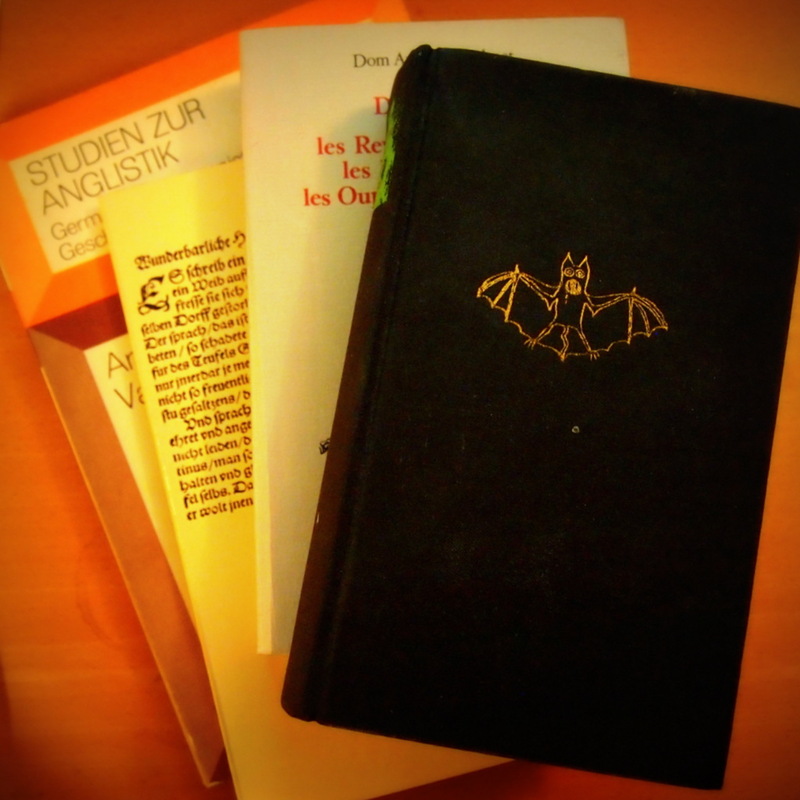 These can be supplemented by a few collections of papers that contain some important and noteworthy contributions: Poetische Wiedergänger: Deutschsprachige Vampirismus-Diskurse vom Mittelalter bis zur Gegenwart (2005) edited by Julia Bertschik and Christa Agnes Tuczay, Gespenster und Politik (2007) edited by Claire Gantet and Fabrice d’Almeida, and Vampirglaube und magia posthuma im Diskurs der Habsburgermonarchie (2011) edited by Christoph Augustynowicz and Ursula Reber. 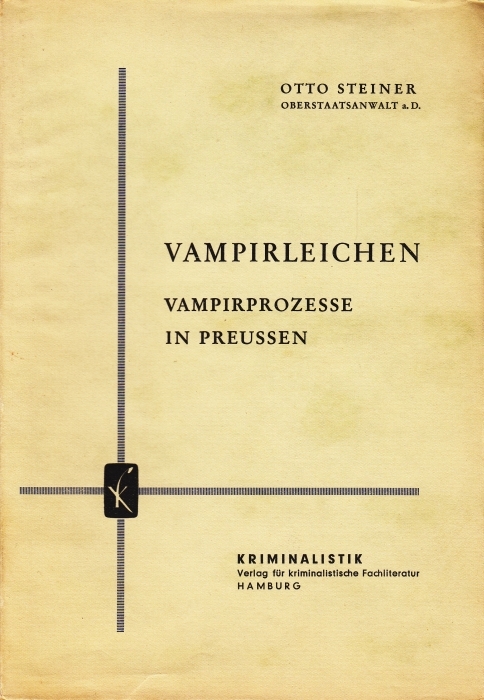 Among the more specialized studies in German, I would particularly recommend Otto Steiner’s rather unique book on the judicial aspects of cases involving the exhumation of “vampires” in Prussia: Vampirleichen: Vampirprozesse in Preussen (1959), Thomas Schürmann’s Nachzehrerglauben in Mitteleuropa (1990) about the masticating dead and their relation to vampires, and Martin Pott’s analysis of the attitudes towards superstition in the German Enlightenment, Aufklärung und Aberglaube (1992). The latter only contains a couple of pages referring to the vampire debate of the 1730s, but provides some fascinating background material for understanding the context of that debate. In French, there is still inspiration to be found in the macabre, but strangely enjoyable writings of Philippe Ariès, in particular concerning the miracula mortuorum in Essais sur l’histoire de la mort en Occident (1975). More recently, Daniela Soloviova-Horville’s Les vampires. Du folklore slave à la littérature occidentale (2011) is a particularly interesting study, because it explores the Slavic roots of vampire beliefs. In English, I suppose that the best history of vampires is contained in Erik Butler’s Metamorphoses of the Vampire in Literature and Film: Cultural Transformations in Europe, 1732-1933 (2010), although I would still consider Paul Barber’s Vampires, Burial, and Death: Folklore and Reality (1988) to be one of the best books in English to analyze vampire or revenant beliefs. As for tales of all those revenants, David Keyworth’s Troublesome Corpses: Vampires & Revenants (2007) is a veritable treasure trove to dip into. The well-known works by Jan L. Perkowski, Vampires of the Slavs (1976) and The Darkling (1989), contain some important information on the Slavic vampire, while a number of books are concerned with the Greek vrykolakas and other exotika, including The Dangerous Hour: The Lore and Culture of Crisis and Mystery in Rural Greece by Richard and Eva Blum (1970), Demons and the Devil by Charles Stewart (1991), and Karen Hartnup’s thorough study of a key source: ‘On the Beliefs of the Greeks’: Leo Allatios and Popular Orthodoxy (2004). Several other books touch on other aspects of vampire and revenant beliefs, but I think the above mentioned books is my best way of listing my “favourites” of non-fictional books. As for fiction, I have fond memories of reading Stoker, Le Fanu, and Gautier, but in the context of this list of favourites I would rather recommend two recent novels that are set in the Balkans: James Lyon‘s Kiss of the Butterfly (2011), as a rare example of a crossover between research into Balkan vampire lore and modern vampire fiction, and Mirjana Novakovic‘s Fear and Servant (2000, English translation: 2009), a Serbian novel in the style of Mikhail Bulgakov’s classic novel Master and Margarita that concerns eighteenth century vampires. As you will have noticed, most of the books I mention are unavailable in English, and I doubt that they will ever be translated. So here is one final suggestion: Why not consider learning to read German? Interesting read. I’ll have to check some of these out.